In one sense, Puri is synonymous, with Jagannatha and vice versa. For more than a centu ry past, historians, foreign and Indian, have been trying to’ unveil the mystery of the three deities namely, Jagannatha, Balabhadra and Subhadra worshipped in the Puri temple. But the success they have achieved is almost negligible. All the same, the traditional authorities strongly hold that Jagannatha is perhaps as old as human civilization. The antiquity of Jagannatha is so much shrouded in mystery that it may take many more years for scholars to arrive at any definite conclusion. There are a number old works in Sanskrit which sing the glories of Odisha in general and of Puri in particular. A passage is frequently quoted from the Rg Veda and explained in the light of the well-known commentary of Sayana to show that the history of Jagannatha dates back to the age of the Rig Veda itself. The Puranas (Voluminous works in Sanskrit containing accounts of ancient Indian history, culture, mythology, philosophy, religion, etc.) present elaborate accounts pertaining to the origin of Jagannatha in an atmosphere of mystery and divine inspiration. Prominent among the Puranas are the Skanda Purana, the Brahma Purana and the Narada Purana. Even in the Ramayana and the Mahabharata, there are references to the Shreene of Jagannatha. The Pandavas of the Mahabharata are believed to have come here and offered worship to Jagannatha. ,Some scholars hold that even Jesus Christ and Mohammed, the founders of Christianity and Islam respectively also visited Puri. But the historicity of such a view is yet to be established. Historically speaking, the antiquity of Jagannatha can be taken to the second century B.C.when Kharavela was the emperor of Kalinga (the ancient name of Odisha). There is the mention of one Jinasana in the historic Hatigumpha inscription of the emperor on the top of Udayagiri hills near Bhubaneswar and though it clearly speaks of a Jaina deity, it is often identified with Jagannatha. But reliable materials in historical form are available from the 9th century A.D. when Sankaracarya visited Puri and founded the Govardhana Matha as the eastern dhama of India. The place where each one of the four Mathas has been established by Sankara is known by the celebrated name of dhama which literally means, a sacred place. Puri is the dhama of eastern India. It is the traditional belief that a Hindu should visit these four dhamas at least once in his life and the prevailing practice is that, after visiting the other three dhamas, one must visit Puri dhama. 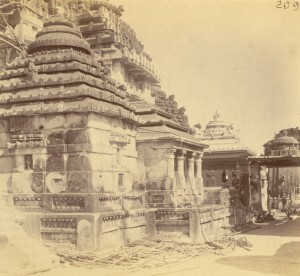 The records maintained by the Pandas in the Puri temple contain reliable materials to show that for centuries past, people from the whole of India have been visiting Puri in course of their pilgrimage. The main temple in Puri is surrounded by about 30 temples, small and big, a list of which may be seen in Chapter 8. They were Put up at different periods of history by different periods. Even to, this day, the pilgrims are generally advised by the Pandas to visit and offer worship in almost all these temples before they are taken to the Jagamohana or the porch to see the presiding deities in the sanctum sanctorum. Jagannatha is not the only deity worshipped in the temple, though it is known as the ‘Jagannatha Temple’. But along with Jagannatha, two others namely, Balabhadra, and Subhadra are also worshipped here. These three, constitute the basic and fundamental Trinity and are considered to be the forms and manifestations of the omni-present, omni-scient and omni-potent supreme power.Sudarsan who is supposed to be the fourth important divine manifestation is also worshipped with the celebrated trio and these four are known as the Caturdha murti or the four-fold divine images.Besides, Madhava, a replica of Jagannatha, Sridevi and Bhudevi are also installed in the sanctum sanctorum and worshipped.